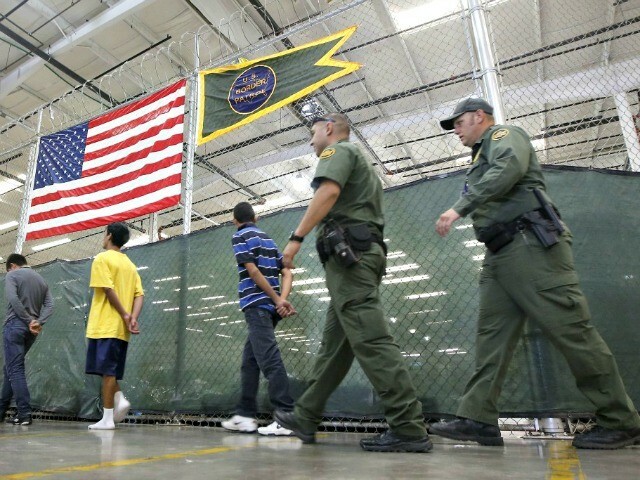 The Pentagon has found two military bases that can temporarily house an overflow of illegal aliens or unaccompanied children while their cases are being processed — Goodfellow Air Force Base and Fort Bliss in Texas. The bases were identified after the Department of Health and Human Services asked the Pentagon to potentially house up to 20,000 unaccompanied children, and after President Trump asked the Pentagon to be able to support any Department of Homeland Security requests to deal with an overflow of illegal migrants and asylum seekers that has overwhelmed their system. “Providing shelter for people without shelter, we consider that to be a logistics function that is quite appropriate,” Defense Secretary Jim Mattis told reporters on Monday en route to Beijing. The housing would be for six months, from July through December, and would be ready by the end of July, a defense official said. HHS and DHS are still assessing who would go to these bases, how many would go to each base, and if there are sufficient facilities or whether it will be necessary to construct tents, and how much it will cost. Any DOD support would have to not impact readiness, the official said. The military would not be responsible for watching, feeding, or securing the migrants, and would be reimbursed for any costs. “DOD is in a support role to federal partners,” the official said. Housing migrants at military bases would not be new. In 2014, the Obama administration housed more than 7,700 children at three military bases for four months: Lackland Air Force Base in Texas, Fort Sill in Oklahoma, and Naval Base Ventura in California.